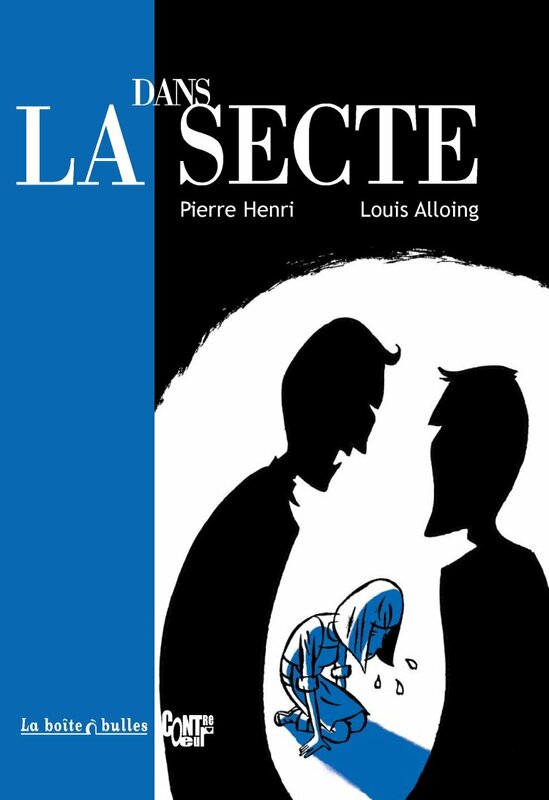 A French magazine explains how one of France's most dedicated Scientologists became its most effective critic – telling his story in the graphic novel format. Roger Gonnet, an old friend of Infinite Complacency, is the subject of a special feature in the latest edition of French magazine XXI – not the first time his story has been told here. This time however, his journey from dedicated Scientologist to the movement's most vociferous critic in France is told in the graphic-novel format. 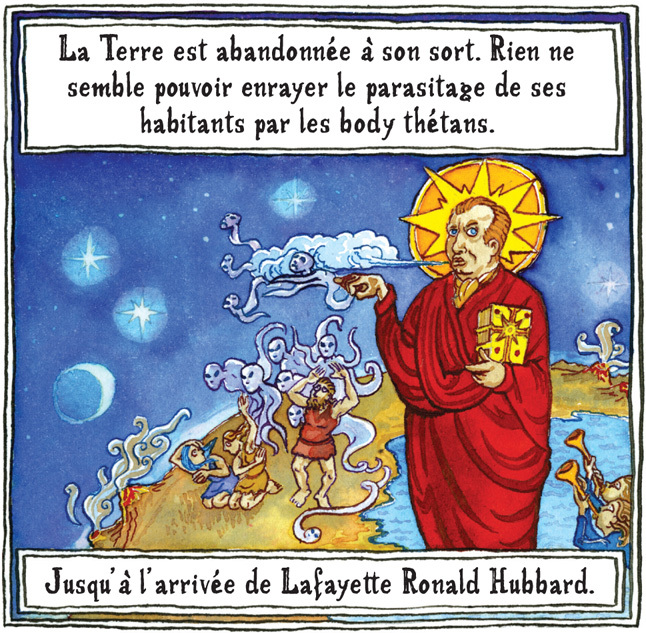 L'Evadé de la Secte (roughly, He Escaped from the Cult) is built around his experience of the movement: but it also works in the basic story of Dianetics, Scientology and its founder, L. Ron Hubbard. In the opening frames De Heyn explains how his interest in Scientology came about through conversations with a friend who works for Belgium's cult watchdog. It is his friend who advises him to contact Gonnet if he really wants to understand what Scientology is about and, at Gonnet's invitation, De Heyn travels down to the French village of Beaujolais to meet him. “At 70 years old, Roger has lost none of his presence,” writes De Heyn. “He reminds you of the statues of Roman emperors.” The accompanying portrait – a good likeness, as anyone who has met Gonnet can see – reinforces his point. In the pages that follow, De Heyn recounts how Gonnet and his wife Françoise got pulled into Scientology by his uncle, who with an American friend ran a successful franchise of the movement. At the time Gonnet was a business consultant and Françoise a teacher: but this was in 1973, at the tail end of what was still a thriving hippy movement in France, when people were open to all kinds of unconventional ideas. Gonnet and his wife are introduced to the basic techniques of auditing, Scientology's version of therapy. They practice on each other the techniques set out in Dianetics: the Modern Science of Mental Health – and, as is often the case, experience startling results. This “home-made” style of therapy, as set out in Dianetics, Hubbard's first venture into the therapy business, was spectacularly successful when he first launched it in the early 1950s. As De Heyn summarises the basic beliefs of Scientology, he develops a striking visual motif. The accompanying illustrations show people hooked up to, restrained by and finally swallowed up in an increasingly complex mechanism: giant cogs, pipes and in one frame a vat in which what look like brains are floating. “I had fun trying to draw a rather infernal machine that crushes human beings,” De Heyn told France Info, a French radio station that collaborates with XXI.4 Fun maybe – but this is disturbing stuff all the same, more Cronenberg than Modern Times. Gonnet and his wife throw themselves into the movement, working all hours as they build up an increasingly profitable branch of the movement using recruiting tools familiar to all Scientologists, such as the personality test. De Heyn also gives us a glimpse of the Communications Course often offered to newcomers, in particular the bull-baiting exercise. This is when members learn how to suppress any response to verbal abuse, a process critics say makes new recruits easier to manipulate. The example he gives is fairly tame: Gonnet taunts his student about the size of his nose in a scene that is amusing rather than disturbing. But as we know from other former members, the abuse can get a lot more personal than that. “Degrading and cruel” is how Perry Scott remembers it in a critique of the training routines he published online. As Gonnet and his family move further into the “infernal machine”, we get occasional reminders of the ever-higher cost of Scientology processing (offered in euros at 2010 prices). The introductory Communications Course is a relatively modest 200 euros ($265 at August 2010 rates). But a course of intensive auditing will set you back 4,200 euros. It is another 4,200 euros for an electropsychometer, the pseudo-scientific device used in Scientology auditing – and as Gonnet explains, you are expected to have two of them in case one breaks down mid-session. De Heyn mentions the packed files detailing the intimate details of clients' auditing sessions that Gonnet accumulates – files that Scientology's ethcis officers can go through in search of compromising material. He describes too the oppressive ethics system that keeps people in line; the threat of being declared suppressive and thus cut off from any chance at Scientology's version of salvation. The accompanying illustration shows the distinctive Scientology “double-cross” converted into something resembling the cross-hairs of a weapon, trained on a hapless figure. Even if the victim's arms are down by his side, the image still evokes something resembling a 21st–century crucifixion: the figure stands about where Christ would be placed in Christian iconography. Scientology is hardly likely to appreciate De Heyn's liberal use – and subversion of – the symbols it claims for its exclusive use. It even has an organisation whose role is to prevent any unauthorised use of what it considers its own copyrighted and trademarked symbols – the Religious Technology Center. Whether the guardians of the flame actually choose to act against De Heyn and XXI is another question, however: surely even they know better by now. De Heyn said he had heard nothing from Scientology's lawyers – and in any case he was not overly concerned. “If their logos are trademarks, so far as I know, nothing prevents me using them in talking about Scientology,” he told Infinite Complacency. “On the other hand, I cannot use them for anything else,” he added. De Heyn goes on to detail the pressure on Gonnet to deliver, every Thursday, constantly improving results, or “stats” to head office – which in concrete terms means bringing in ever-larger sums of money. It is just that pressure of course that fuels the culture of hard-sell within the organisation. And the story has a special section devoted to Scientology's central founding myth, as revealed in the now-notorious upper-level document OT III: The Wall of Fire. 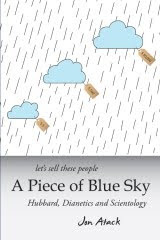 In a vivid two-page section, De Heyn changes tone to tell the now-familiar story – H-bombs, DC-8s, volcanos and all – in a style evoking an ancient illuminated manuscript. His version of Xenu, the villain of the piece, is a kind of intergalactic octopus, a distant cousin of the Elephant God Ganesh. De Heyn also describes Scientology's Purification Rundown, the programme of aerobic exercise, extended sessions in the sauna and massive doses of minerals and vitamins devised by Hubbard – and heavily criticised by experts as potentially lethal. He recounts the near-miss Gonnet had when he ran the programme at his centre and a client suffered an allergic reaction to medicine she had taken just before Rundown. The story follows Gonnet's progress through the movement into the 1980s, when he fell victim to the increasingly irrational and authoritarian management style of the new generation of leaders led by David Miscavige. Declared suppressive and cast out of the movement – his wife resisted pressure from the movement's officials to divorce him – they are forced to rebuild their lives. While his wife continues to pursue different spiritual paths, Gonnet struggles to digest what had happened to him during his time in Scientology: to understand how the machine consumed and corrupted him before spitting him out the other end. It is that process of reflection that led him to turn campaigner, using his inside knowledge to become a valued source of information for the French authorities as they began to act to stop the movement's excesses. Towards the end of his account, De Heyn tells how the Gonnets' marriage eventually broke in the aftermath of their passage through Scientology. While Roger had become a campaigner and polemicist against the movement, his wife, he tells De Heyn, never found her way out of magical thinking encouraged by cults. Françoise died of cancer in 2002, having refused to seek conventional treatment for a condition she believed had been caused by “an unresolved psychological conflict”. 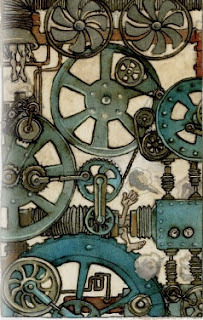 But De Heyn's version, his arresting vision of the mechanics of that “infernal machine” and what it does to people, gives the story a fresh lease of life. The dossier in XXI is rounded off with sidebars on a number of related topics: on Scientology's founder L. Ron Hubbard; on the movement's policy of chasing celebrity members; and a round-up of the movement's legal status across Europe – routine stuff for anyone familiar with the subject, but a useful overview for anyone new to the territory. But even those well-versed in the subject will appreciate De Heyn's visually rich take on Scientology. “Marion” spent only a year inside, including several months in the Sea Org at Copenhagen, followed by a legal battle with the movement – but it left its scars. As Catherine Picard, president of France's anti-cult alliance UNADFI, points out in her introduction to the book, the particular strength of her story is that it is so typical of many other former members. But this book is only available in French and there are no plans so far to translate De Heyn's account into English. That is a pity, because to my knowledge no one has yet tackled this subject in graphic-novel format in the English-language, a gap in the market that ought to be filled. And Scientology, not its critics, may soon be filling that gap. If industry reports from earlier this year are to be believed, a comic-book version of Hubbard's critically panned space opera Battlefield Earth is in the works. 1 XXI – or Revue 21, if you prefer – is a strange publishing hybrid which to my knowledge has no equivalent in the English-speaking markets. Its long-form reportage and investigative journalism is illustrated by photography, artwork and – as in this case – the graphic-novel format. 2 You can see his work at this portal for illustrators and “graphic novelists” at grandpapier.org and his page at publishers Casterman (never mind the French text: enjoy the artwork). 3 For more on this hard sell aspect of Scientology, see Kevin Stevenson's account as set out in his lawsuit, covered here earlier this year: “Settlement rejected in Irish Lawsuit”. For another story of relentless hard sell, see the testimony from one of the plaintiffs in the 2009 Paris trial, of Scientology on fraud and other charges: “The original Plaintiff”. 4 You can hear the France Info interview (in French of course) at the XXI website here. XXI has a partnership with France Info radio station: they promote each others' work and jointly sponsor a prize for young journalists. 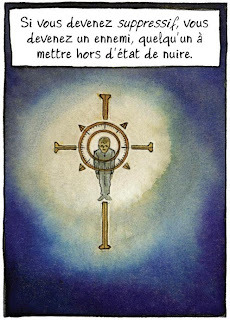 5 You can see Gonnet's account of the personality test during the 2009 French fraud trial of Scientology elsewhere on this site: The Apostate Gonnet I. Scientology as an organisation was convicted of fraud, a ruling confirmed on appeal. The movement has appealed to France's top court, the Cour de Cassation, and we are still waiting for their ruling. You can find Gonnet's testimony earlier this year to the French Senate's committee investigating the influence of cult-like movements in the health sector here. I expanded on it to give his account of a client's near fatal encounter with Hubbard's Purification Rundown: see “The Rundown: a close call” elsewhere on this site. 6 From “Scientology Training Routines”, by Perry Scott. Here is how Claire Headley recalled it in one of her regular dialogues with Tony Ortega at The Underground Bunker. “Several times I just outright broke down in tears, and then did a real good job of hiding my tears from my supervisors,” she told Ortega. 7 De Heyn tells me that he has heard nothing from Scientology about the use of their symbols; I have not heard back from XXI. Crowley's cross of course, is derived from one used by the Rosicrucians of the Hermetic Order of the Golden Dawn, of which he was once a member. 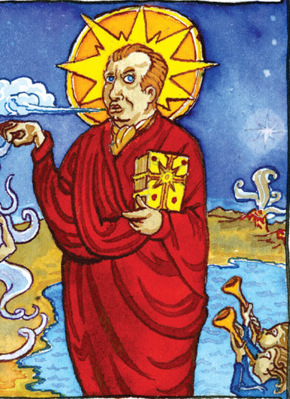 This is a version of the cross presented at the site of what claims to be the genuine Esoteric Order of the Golden Dawn; you can find the same version at the site of the Thelemic Order of the Golden Dawn – which is to say Crowley's breakaway version (go to the bottom of their home page). For more on Hubbard's true relationship with his occult predecessors, see “Spy v Spy I” elsewhere at this site. De Heyn also uses Scientology's double-triangle-S symbol, which so far as I know, is unique to Scientology. Again though, one wonders if Scientology is quite stupid enough to go after him in the courts: that, surely, would be an epic foot-bullet. 8 Another nice touch from De Heyn is a recurring portrait of Hubbard, coloured differently each time it appears, à la Warhol. Some of the more psychedelic renderings make him look positively Wildean. 9 I covered this incident in detail earlier this year elsewhere on this site: see “The Rundown: a close call”. For critiques of the Purification Rundown, see my coverage of the 2009 trial, “The Purification Rundown”; and “Narconon: an Introduction”. 10 Gonnet's website include antisectes.net, scientologie.fraude and xenufrance.net. For English-speakers, perhaps the xenufrance is the most accessible, though from the researcher's point of view, the most interesting material is in the French-language sections. Hard copies of his book La secte : secte armée pour la guerre : chronique d'une "religion" commerciale à irresponsabilité illimitée are still available, but he has also made it available for free at one of his websites, here. 11 The script is by Pierre Henri (apparently an alias for P. Guillon); artwork by Louis Alloing. 12 Picard, a former deputy in France's National Assembly, took a special interest in cults and was one of those behind the so-called About-Picard Law passed in 2001 which allows for the dissolution of cult-like groups that violate human rights. For more on Picard, see her testimony during the 2009 Paris of Scientology elsewhere on this site: “Picard for UNADFI”. Thanks for the tip: have added it to the bottom of the piece.